"Each year, tens of thousands of visitors flock to Tombstone, Arizona — a historic outpost on a barren stretch of desert 35 miles north of the Mexican border — to experience the lifestyle of Western legends. Guided tours and historical re-enactments have kept the small Arizona city booming, but after an actor mistakenly used a gun full of live rounds in an October performance, the future of Tombstone's tourism industry came under question. This Saturday, though, the actors were back to their old routines to the delight of visitors, like Zachary Palicte, pictured here. 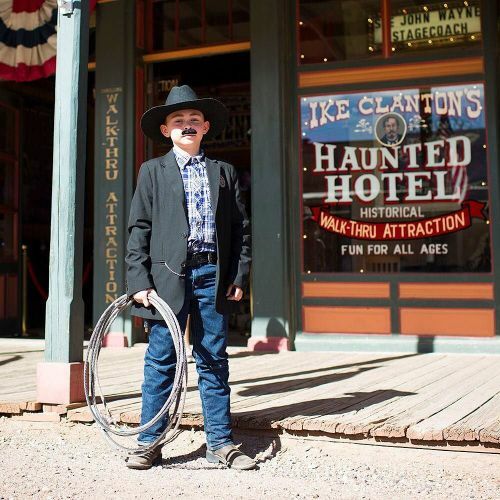 @caitlin_oh photographed the 11-year-old Doc Holliday fan, wearing a fake mustache and sporting a sheriff's star on his lapel." By nytimes on Instagram.